The door locks on your Volkswagen keep your vehicle secure when you are not in it. The lock will prevent someone from getting into the vehicle and stealing your property. In addition, you can lock the doors when you are inside the car. Because the lock gets a lot of use, it can wear out. Whether you use the key or a remote on your fob, a lock that does not work offers you less security. If the lock on your Routan is becoming hard to work, you may need to replace it. 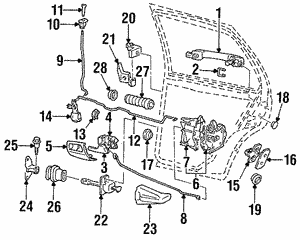 Replacing the lock with a genuine OEM replacement part means that you get a part that you know will fit. The lock needs to fit in the door handle. A lock that does not fit securely may not operate as it should. The lock needs to be made to fit. Genuine OEM parts ensure that they are exact fit like the factory part. A loose lock does not work well. We do not offer cheap aftermarket copies of OEM parts. You are getting a genuine Volkswagen part. We offer excellent customer service, with free parts look-ups by phone. Call us if you have any questions about your door locks. We have a no-hassle return policy. Use our handy online order form to order your parts today.